The night sky – we all know or can perhaps imagine what it looks like. Representing the sun, moon and stars begins very in childhood with drawing, and can be a very symbolic and exciting presence in our lives when we are young. As we grow up, intellectualise and learn all that we know about the universe, and theorise about the bits that we don’t, we develop understanding, belief, questions, conundrums. We quest to understand and create our own sense of our world. In short, when we look up, we find ourselves facing big questions. 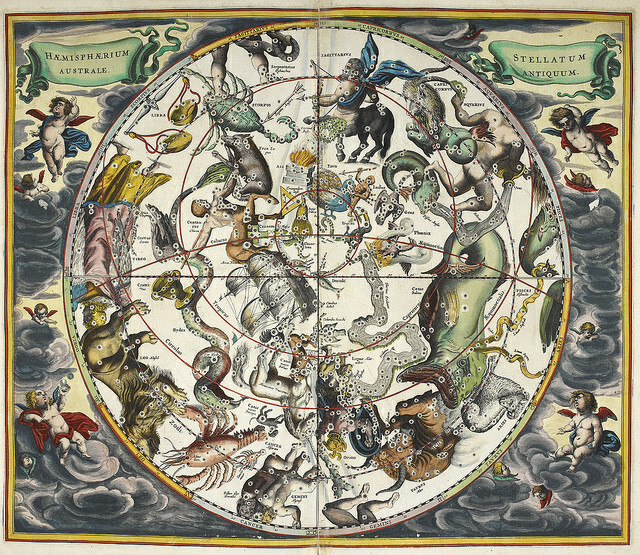 Title: Atlas Coelestis., Andreae Cellarii, Public domain British Library Flickr collection. This led me to wondering – is the night sky one of our most complex and sophisticated thinking tools? It’s often visible with the naked eye, and, is free – but sometimes, strangely, overlooked? So, this is an experiment to see if we can learn something about learning, using the whole cosmos. A bit ambitious…but an adventure. What do you know and feel? Your assignment task – What do you see? Add a comment to this this image of the night sky (on Marqueed) describing what you see in the picture. (Having problems with the image displaying in Marqueed? – use this Night Sky google doc). Part 2 of this challenge will be posted once there are a few comments on the image, as what you respond may change the shape of this activity…. Marqueed doesnt work with my browser, I am afraid. Agh thanks for letting me know Nick. I was in two minds whether to just use google docs only, but wanted to road test Marqueed too. Works in Chrome – I left a comment. Marqueed signup was simple enough – via Google or FB – but path back to your photo was a bit confusing. Will try chrome. I think there’s sunspot activity fooling with the Supernet. Or the change of government?